6 Tree Houses and Play Spaces for Kids | Wood. It's Real. | Wood. It's Real. If you think back to your childhood, your mind probably wanders to your favorite spot. A hideaway is an essential place for kids — a safe spot to play, unwind and dream of all things they want to be when they grow up. Let’s face it: It’s also a place to hide from parents and the pressures of growing up — and that’s okay! Tree houses, clubhouses, and other play structures also offer modern parents a second chance at being a kid. After all, this is the one DIY project where you can honestly let your imagination run wild. All you need to make a fantastic space for your favorite kid is some Southern Yellow Pine, a little building know-how, and some creativity. Southern Yellow Pine is an excellent choice for outdoor structures because you can purchase boards that have been treated to resist water damage and rot. It’s got top-notch strength for framing that requires structural support, and the density of the wood holds nails and screws snug for long-lasting connections. 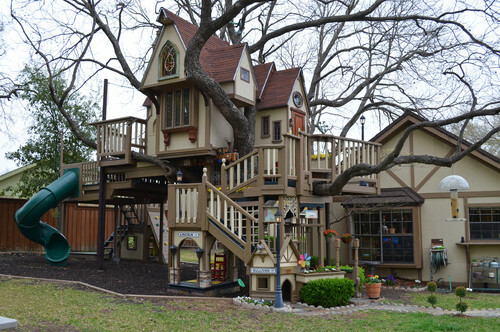 To get you started on your outdoor play structure, take a look at some genuinely impressive tree house designs that are sure to light up your designer’s mind. Maybe one will be perfect for your backyard! Everything is bigger and better in Texas, so it’s no surprise that this incredible, 100-square-foot masterpiece is from the Lone Star State. Stained glass Gothic windows and a balcony are some of the architectural standouts, while kids will appreciate multiples staircases, a climbing ladder, a slide and a suspension bridge for active play. 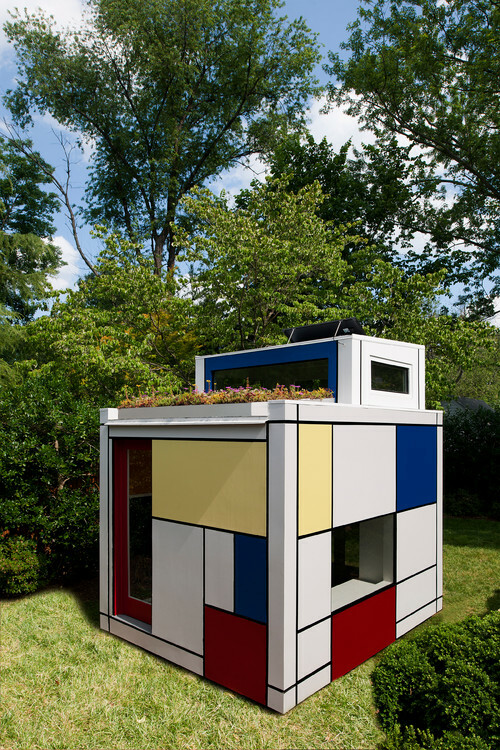 Bright color blocking and geometric shapes turn a simple cube of a shed into a pint-sized work of art. The exterior features whimsical widows of several sizes and a rooftop garden, while inside there’s a loft, a chalkboard, and loads of natural light. Built-in shelves are a practical touch for storing toys and treasures. 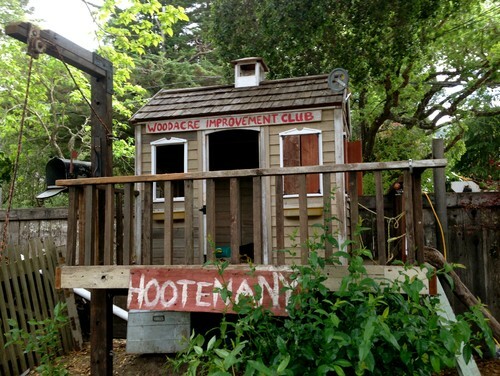 This retro-inspired clubhouse looks like it’s been around forever because it’s made with salvaged and reclaimed materials. If you’re flexible and looking for bargains, you can scout around for used windows and details like a small cupola to make a 100-percent unique play spot. Other cool features include a mailbox for secret messages and a pulley system for sending up snacks. 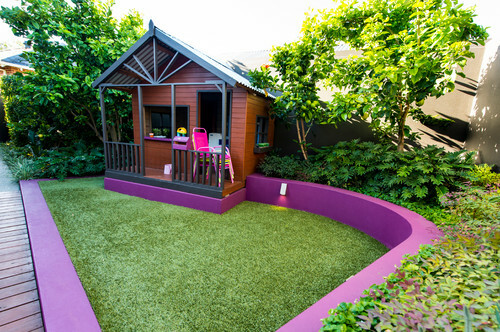 Your playhouse doesn’t have to be an afterthought or something you hide away in the corner of your property. This design integrates a play shed for children into the bright retaining wall complete with manicured garden beds. The stick-style structure features a cathedral ceiling, corrugated roof, and a pleasant porch. Looking for something straight out of the Swiss Family Robinson design book? 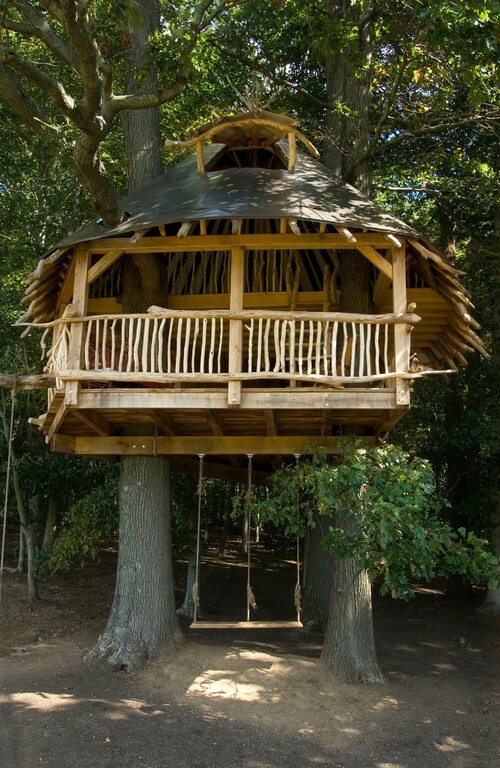 This round tree house is supported by two trees and is capped off by a cone-shaped metal roof. There’s also a wide veranda with lots of shady seating, and the tree house is high enough in the area to support a swing from its floor deck. Is it a tree house or a house for a tree? 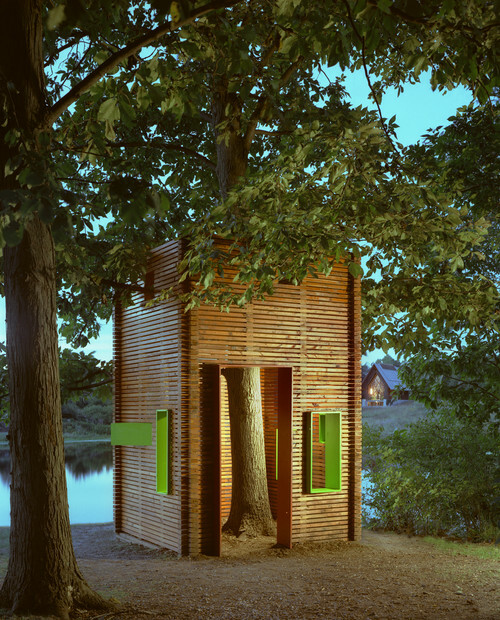 This fun take on a treehouse is positioned on the ground and encloses a tree to create a quiet hideaway. The only roof is the tree’s leafy canopy, though you could modify the design to include a more weatherproof covering for rainy day play. No matter what your budget or taste, there’s sure to be a treehouse design that appeals to your inner child — and to your actual kids. Get the whole family involved in the design for a fun, fulfilling project that everyone can enjoy together, from the first brainstorming session to the moment you drive in the last nail.